Back once again with another look at the current CW Seed webseries Vixen that ties in with the CW’s Arrow and Flash universe, animated by the fine folks at DC Animation complete with quality befitting that of one of their straight to video animated movies. Again, there is no embedding so click the link below to watch the episode over at the CW Seed site, or watch it on their app. 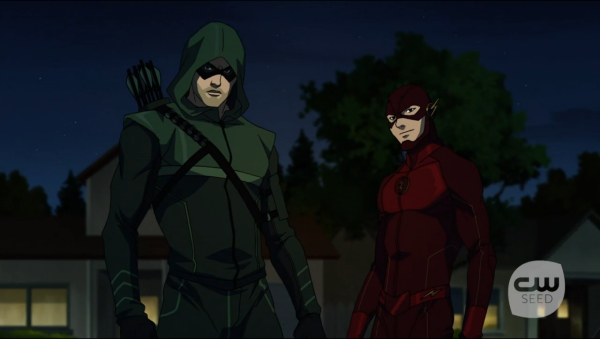 This time around we get a nice breath of humor before Flash and Arrow come knocking on the door. Even though this episode doesn’t really further the plot, or even really give more information about Vixen as a character it was still nice to get a little breath of fresh air to inject some humor into this series. It starts out with Mari trying to convince her adoptive father of her necklace’s magical properties while he continually tries to laugh it off as a joke. It does have one nice little moment of hesitation that calls back to the first episode when she tries to summon the spirit of the hawk to allow herself to fly off the roof of her house, but backs off at the last moment. During the first episode it also ended the scene with her falling off a building, seemingly unable to fly. I’m not sure at this moment if that’s a limitation of her powers, or if she just has to fully believe like Neo in the Matrix before her powers allow for that kind of strength. Besides the time spent with Mari and her father, we also get a fun scene with the introduction of Cisco to this animated world. It follows right along with the Flash series where Cisco gets his chance to give Vixen her superhero name, or technically metahuman name. It also clarifies for those who again aren’t familiar with her that she isn’t in one of the made up DC cities, but instead is actually in Detroit. And it ends pretty much where the show started in episode 1 with Vixen on the run from Flash and Arrow, though not quite on the building just yet. I imagine that the next episode will once again start with some of the same snippets that started in the first episode to get us back up to speed. So far, this has been the most fun episode even though it didn’t really give us anything about her character that we didn’t already know.